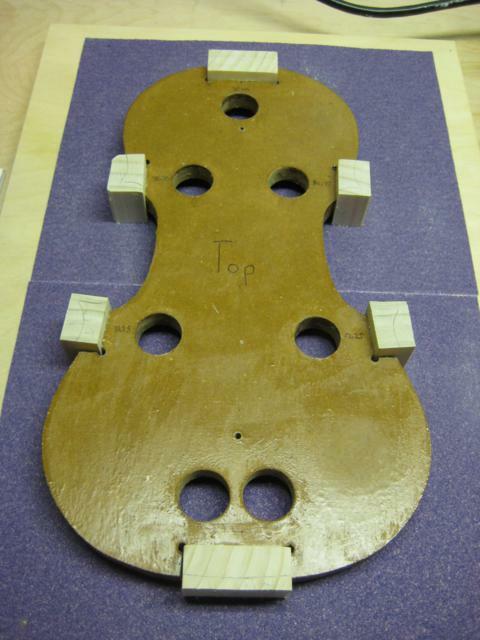 Next, I worked on the blocks which can be thought as the structural supports of the violin. For block wood I used willow from Orcas Island Tonewoods. Special consideration must be taken in cutting the blocks so the grain orientation is correct which makes shaping them later easier. In the end, I still don’t think I got it completely correct (more on that in shaping the blocks). The block thicknesses also had to be fairly exact to save time sanding later. I then cut the blocks down to a more manageable size. My first attempt at gluing the blocks failed miserably because there was too much polyurethane in the block recesses where the glue went, so it did not adhere. I sanded down the block recesses and tried again with much better results. 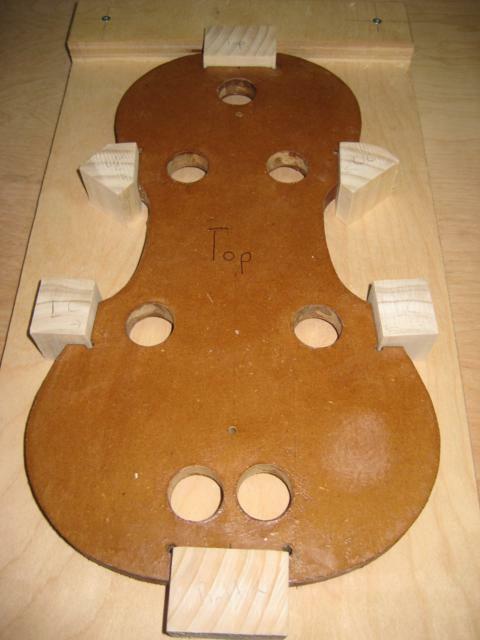 I don’t have a picture but on the bottom of the mold are three screws that raise the mould up so the blocks are centered. This was my first time ever working with hide glue. 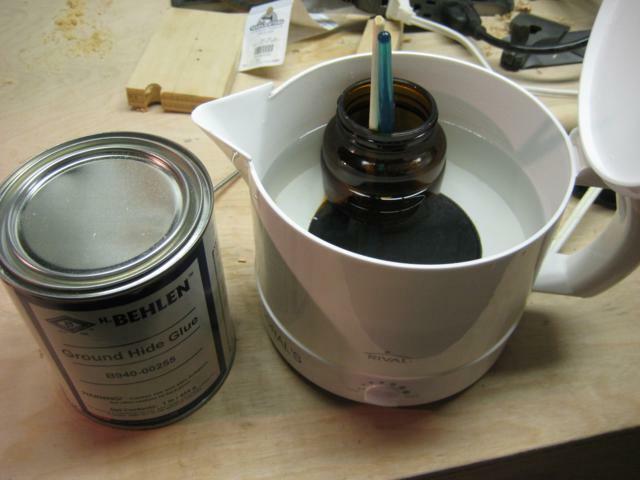 Hide glue requires you to heat it up to a specific temperature before use. Instead of spending $100 on a real glue pot, I went to the Portland Goodwill Outlet (“the bins”) and bought a water boiling pot for $1.25. “The bins” is worthy of its own story, but I’ll save that for another time. Now I must level the blocks. 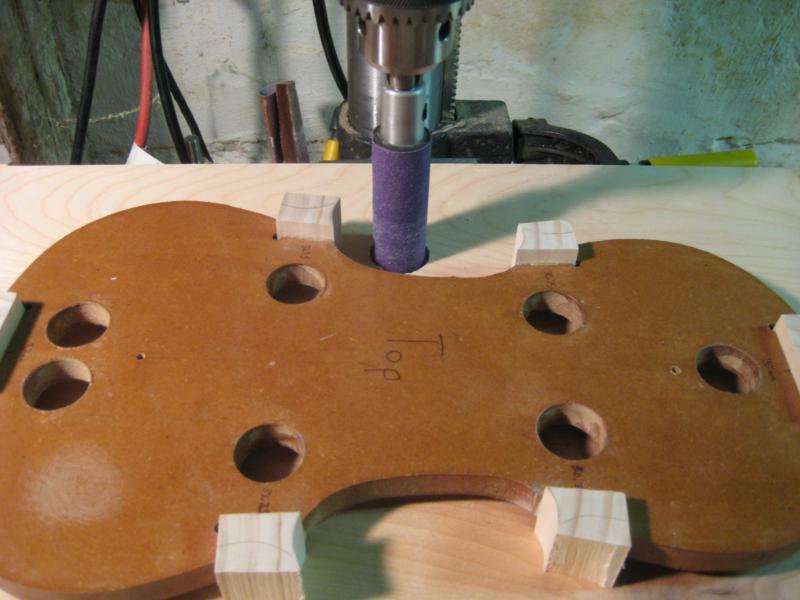 To do this I used two pieces of 80 grit sandpaper glued to plywood with spray adhesive. The blocks are slightly thicker at the bottom, so I had to stop and check the thickness quite often. I then began shaping the blocks so they match the pattern. For now, I’ll only do the top, bottom, and insides of the the inner blocks. For the top and bottom blocks I used a chisel and some sandpaper. 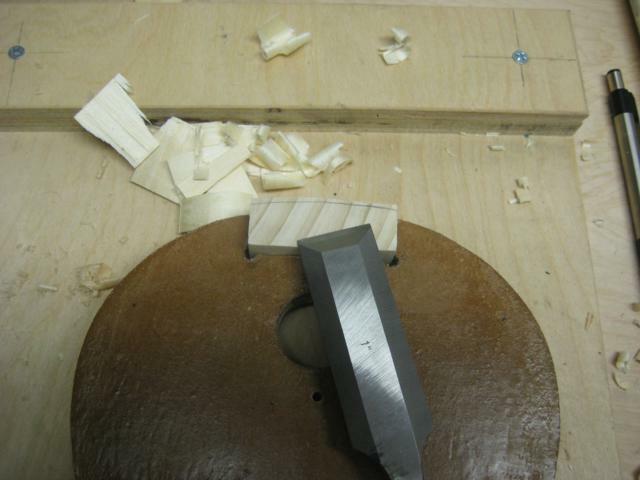 This was the first time I got to try out my chisels after sharpening them on a Veritas Power Sharpener that I picked up on Craig’s List for cheap. I can literally shave with them now they are so sharp. Even though they were so sharp, I made a minor mistake cutting down one of the blocks and went slightly into the waste area. I think this is because I didn’t get the grain orientation completely correct when I cut the blocks. Live and learn. For the insides of the corner blocks I first trimmed them close to size and then used a sanding drum on my drill press. At first this was incredibly slow and tedious, but then I switched from the sand paper the drums came with to some nicer stuff and it went much quicker. 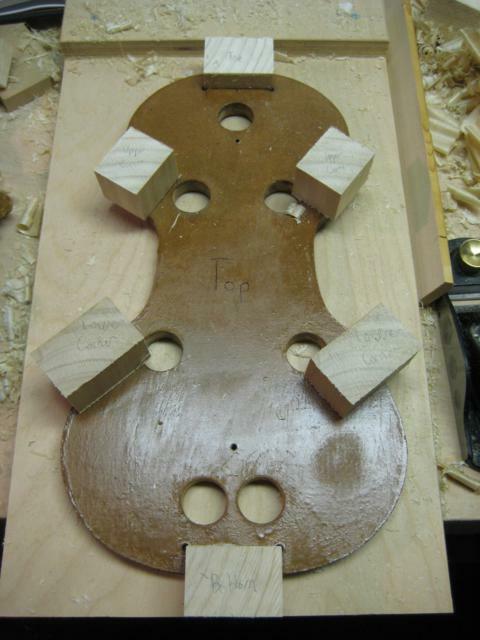 On my next violin I’d like to try using an in-channel gouge, but I’ve already spent too much money, so I decided to use the tools at hand.